Remember the first time my child humbled me? By, you know, showing up while I was in the middle of forcing myself to try to nest? 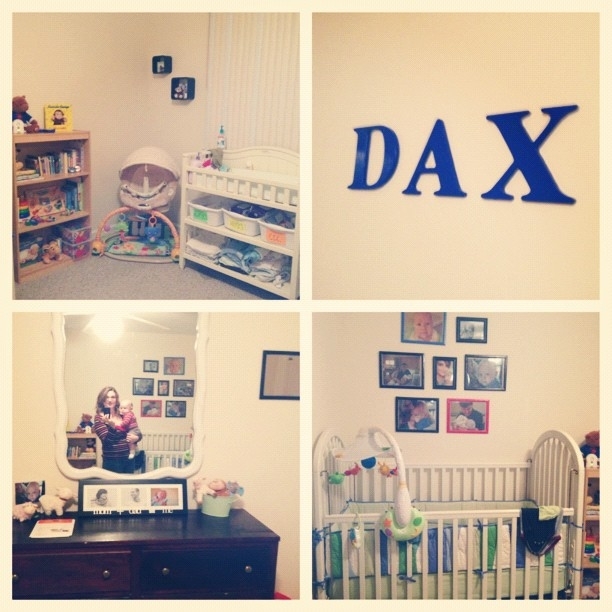 Well, the nursery kind of has stayed in that half-nested-but-mostly-not state of disarray since Dax’s birth. Not only did I not have the energy to even think about decorating (too busy climbing Mount Laundry and conquering nightfeeds, probably) but I also just don’t have an eye for decorating. It’s something I’ve always wished I could be, but in recent years I’ve just accepted it. I’m not a decorator. And that’s okay! You know why? Because I have great friends who are! My sweet friends Kelby and Sarah volunteered to transform my mess of a second bedroom into a super adorable nursery that is, in my opinion, absolutely perfect for my little boy. There are still some things left to do, but it’s really cute so far. Check it out! Isn’t it awesome? Aren’t my friends the best? I’m pretty sure my favorite part of the whole room is the bookcase. For my baby shower, everyone brought a children’s book for Dax in lieu of a card, and all of them have sweet messages to Dax written in them. Not only is the bookcase arranged in the cutest way, but it is a clear reminder of how truly loved Dax has been, even since before he was born! And he’ll have those books for ages. It’s so special to me. Such a sweet nursery made by sweet friends for the sweetest baby!